This article presents an overview of how social science methodologies can be mobilised as part of environmental forensic investigations. The article begins by providing an introduction to the field of environmental forensics and the types of approaches and methods generally utilised in this area of work. It then describes one particular approach to the study of toxicity, using the example of contaminants to air, water and land in residential areas. 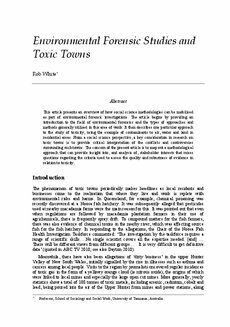 From a social science perspective, a key consideration in research on toxic towns is to provide critical interpretation of the conflicts and controversies surrounding such towns. The concern of the present article is to map out a methodological approach that can provide insight into, and analysis of, stakeholder interests that raises questions regarding the criteria used to assess the quality and robustness of evidence in relation to toxicity.